Carrie Wintle grew up on an area farm. Her promotion of financial literacy for youth of all ages is inspiring. I have asked her to guest author this month’s article of the Prairie Tracks for you to gain an understanding of the work she is doing. The ag community, and in fact every consumer, should be armed with these financial fundamentals, and learning them at a young age is all the better. An accomplished pianist, dancer, and recent college graduate with graduate school on the horizon; Carrie has now added children’s book author to her resume. I have ordered my copy of her children’s book, Mr. Money $heep, and, after I study up, I might let my kids and grandkids read it! I asked Carrie to tell us a little bit about herself and her book this month — enjoy! As a young girl, raised on a farm just South of Cavour, SD, I was heavily involved in 4-H. My love for animals was unbreakable and led me to try showing all of them in 4-H, even my cat (I wouldn’t recommend this). Eventually I stumbled upon the idea of showing a lamb. Soon after, I bought my first lamb, Pookie. Thus began a 10-year journey that grew from one lamb to a 40 plus sheep flock. This experience, along with my interest and studies in math, led to my platform as a Miss South Dakota contestant, Money $heep. The goal of Money $heep is for youth to build a financial foundation from which they can tackle the financial world. Although I use my personal experience of owning lambs to talk about financial literacy, every student’s experience is different. The important part is for youth to learn how finances relate to their own personal life. Money $heep is centered around the Five Foundations of Financial Literacy: budgeting, saving, income, loans/debt, and investment risk. These five financial topics equip youth with a base of financial knowledge they can use in their lives and the world. I choose to focus on this base of knowledge because it is critical for youth to learn the basics before advancing into more complex areas. Think of it like mathematics. Students learn to add, multiply, divide, and subtract in elementary school before advancing into harder classes. If a student never learns the beginner topics in math, they will not be able to learn the harder topics. He or she will continue to progress through math classes without understanding the material. The same is true for finance. If youth neglect the basic financial concepts, by the time they reach adulthood they will be unable to truly understand harder topics. Money $heep’s action plan involves an extensive speaking tour. As a contestant, I visit schools throughout South Dakota to speak about the Five Foundations of Financial Literacy. Every speaking engagement is different because all students have unique needs. I strive to make each presentation impactful by relating it to the audience and students. Furthermore, I authored an illustrated book called Mr. Money $heep with artist, Rayna Pearson. The book is written in an interactive, play format that allows the students to take part in the learning experience. The book can be purchased on Amazon, with all profits going towards purchasing books for students in South Dakota. 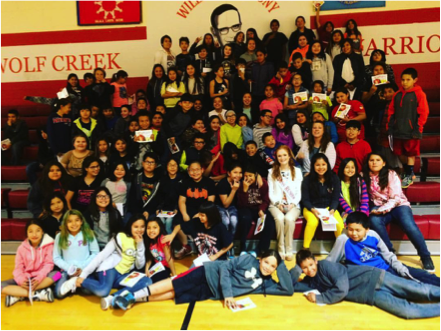 Finally, thanks to a sponsorship from White Oaks Wealth Advisors, I donated 800 copies of Mr. Money $heep to the Rosebud and Pine Ridge Reservations in South Dakota. Getting to travel the state to talk with students about Money $heep and the Five Foundations of Financial Literacy has been a blessing. Using my Finance and Accounting degree from the University of South Dakota to help youth build their own base of financial knowledge is exciting and rewarding. I am excited to see how Money $heep can help more students in the future.